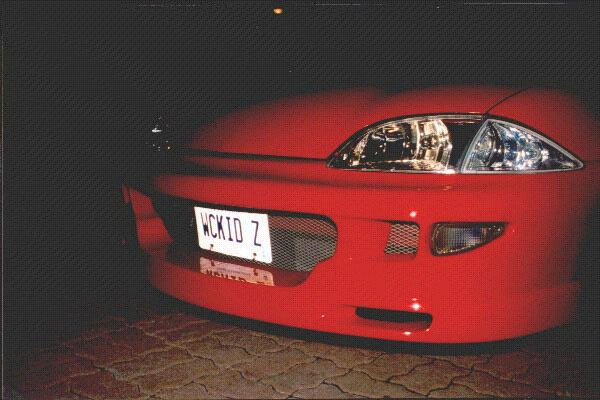 There has been much speculation about how to do the Y2K Clear Corner lights. Well I am going to provide you all step by step instructions on how you don’t have to spend any money at all for a very nice looking modification. Please follow the instructions very carefully, and remember I am not responsible if you damage any part of the light or car. Open the hood and remove the plastic plugs that hold the black covering on your lights. These come off by first pulling up on the center lock pin and then simply pulling them out. Remove the black protective covering. When you remove the black covering, you will see the 2 bolts that hold your headlight in place. Unscrew those. Do not touch the brass torque screws as those are for aiming the lights, not removing them. When your headlights are loose, unscrew and remove the headlight bulb and the corner light bulb. Take both headlights and corner lights off the car. Separate the corners from the headlights so it allows you to work much easier on the corner light. Note: There are no screws that hold the corner light to the headlights, it is simply a little clip the detaches them from the headlight. You will notice that the orange piece that covers the light bulb is made from a very think, durable plastic and will be difficult to remove. Hold the corner light in your hands and use a dremel tool or anything else that can cut and fits inside the small hole where the bulb goes. If you don't have a dremel tool, you may be able to use a drill with a bit that will cut sideways as you move it. Note: Very Important! When cutting the plastic, make sure that you don’t cut or hit the outside of the corner lens where the light bulb goes on, if you do you might cause it to leak or make it impossible for the bulb fit its mount again. Be CAREFUL! From the little opening where the bulb goes in, use the dremel tool and begin cutting away at the orange plastic covering. Make small pieces, and don’t worry about the orange dust and the pieces falling in the corner lens. After cutting the pieces, remove them all from the inside of the corner lens. Once finished that you will notice that the remains are still stuck to the lens. Take a screw driver and hit the remains and they should pop off. Pull that through the opening and your done with that part. That was the hardest procedure in the entire operation. Have the corner light in your hand and turn it to the side (the side where it holds up against the headlight) and you will notice a round blue sticker (it may be different colour). Remove the sticker and you will expose a small hole and be able to see the orange reflector. When you see the hole, get the hammer and the small screwdriver ready. Place the small screwdriver in the small hole, and hammer it with a bit of force; making sure you don’t kill the corner light. The orange reflector will begin to crack. Keep hammering it gently until the entire piece breaks off and falls inside the corner light. Note: Make sure you don’t shake the corner light aggressively because it scratches easily. Remove the broken orange pieces through the light socket hole. If the pieces are too large to pass through the hole, get a pair of cutting pliers and try grabbing the plastic pieces and cutting them into smaller ones to get them out. The stock light bulb is a rather dim yellowish colour. Go to a performance shop and by the Xenon Hyperwhites for the corner lens and it will look nice and clear. Be sure to wash out any orange pieces or dust with water and allow the corner to dry over night. Make sure you are rid of any water before reinstalling or it will condensate. Be sure to replace the round blue sticker or tape up the side of the corner lens where that sticker was to make sure that water doesn’t get in. Reinstalling the lights is the reverse of what you did to remove them. Good luck, and enjoy your new clear corner lenses. Do be careful when doing any modifications to your car. We are not responsible for any damage you may incur while attempting to follow these directions. This is simply a guide to what Raponi did when making his own clear corners.